We all have one word on our minds— springtime. This time of year always invokes feelings of simplicity, accompanied by a desire to bring warmth and light to our everyday. It is natural that these feelings tend to manifest in our homes. Whether it's tucking away the lingering Christmas decorations, or delving into a deep spring clean, there is a desire to 'refresh' by revisiting the spaces that we spend the most time in. 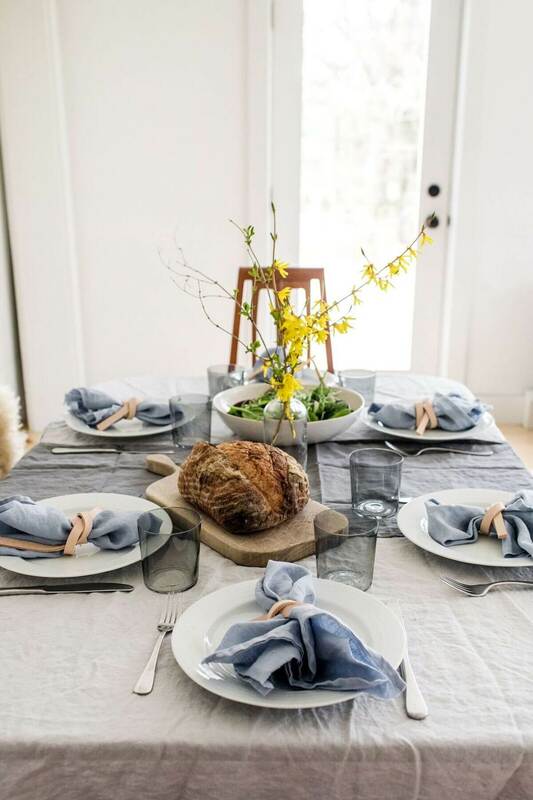 We've tagged along with Megan Gilger of the Fresh Exchange to get an inside look at how she finds reprieve in her home after a long winter. The remnants of winter are fading with each passing day now as we have officially entered spring. All around us we can see signs of spring. There are flowers popping up. The trees are budding. Birds are chirping. Most importantly our spaces are beginning to feel brighter and more full of light than they have in months. As we watch winter fade away, now is the time to think about how we will bring in light and airy into our homes and work spaces. My husband and I spend quite a bit of time in our gathering space in our home. Every family meal with our son is eaten at this table and we often spend time in the morning and evenings on our own enjoying coffee or tea in this space. So, when I think of spaces I want to bring a refresh to, I think of our gathering space. With spring coming into our small gathering space more and more with open windows, I think how can we bring this same feeling into the space, so we feel inspired to do what we love the most. I decided with just a few simple updates I could bring that same spring refresh into one of our most lived in spaces very easily. I love the Float Frames from Artifact Uprising. 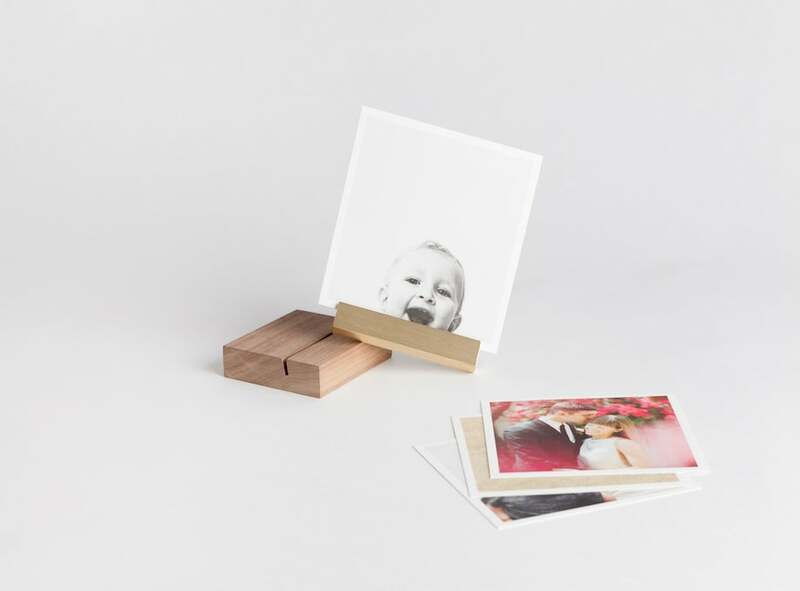 They are beautifully minimal and bring your eye instantly to the images. 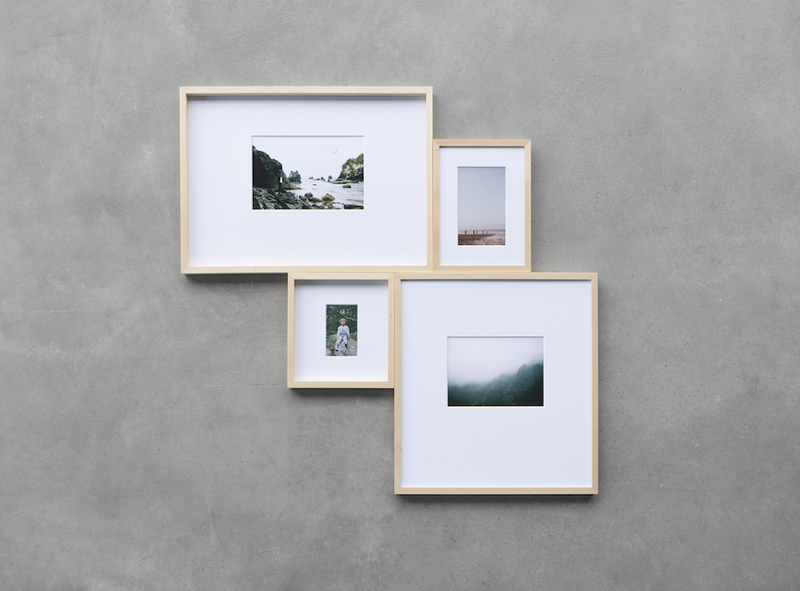 For spring and summer these frames are perfect to leave the space feeling full of light and simplicity while displaying things that matter the most to us. 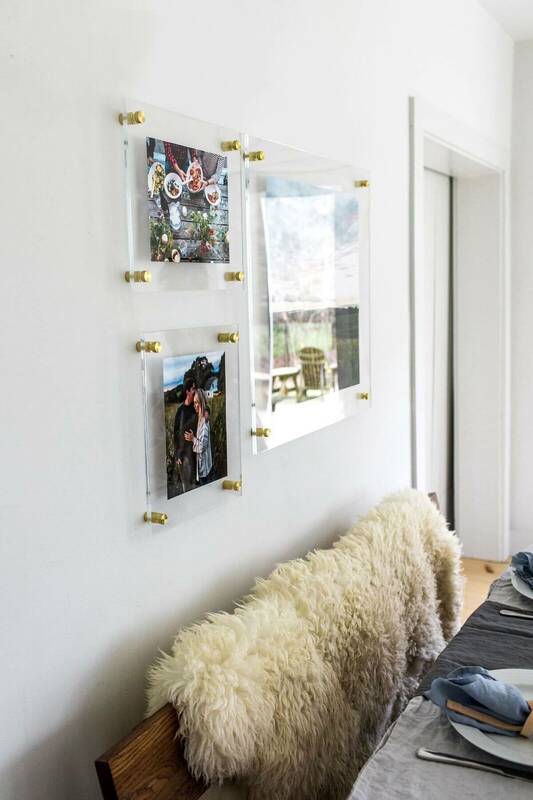 I chose three sizes that I felt would bring varying interest to the small wall. I used a 26x26, a 12x14, and a 14x12 for our wall. 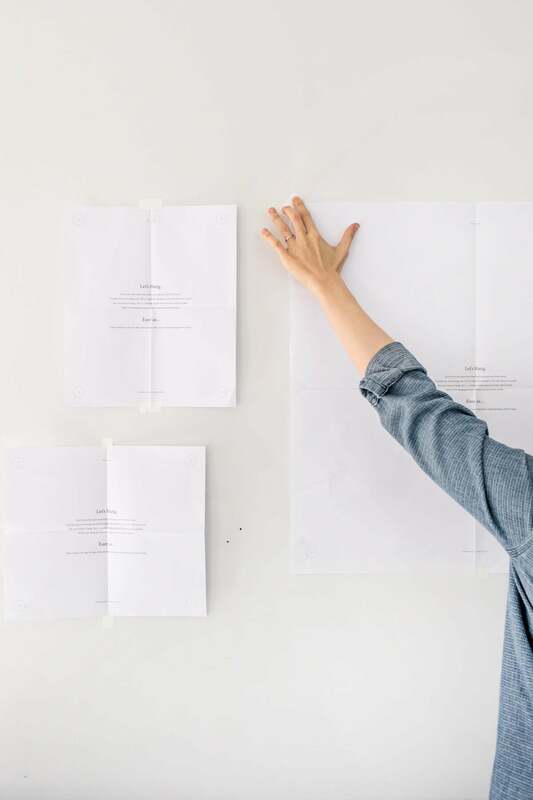 To make it extra easy to position your frames in the right place, Artifact Uprising sends along sheets the exact size of your frames. I love this because you can tape them up, step back and then rearrange if need be. 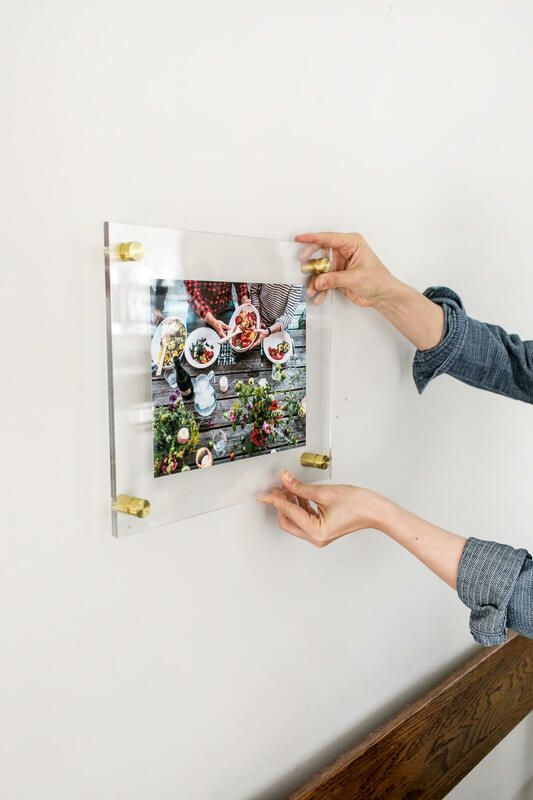 This ensures you have them in the exact spot you want them and takes the guess work out of making your perfect gallery wall. For our Float Frames I chose images from a gathering the summer before. 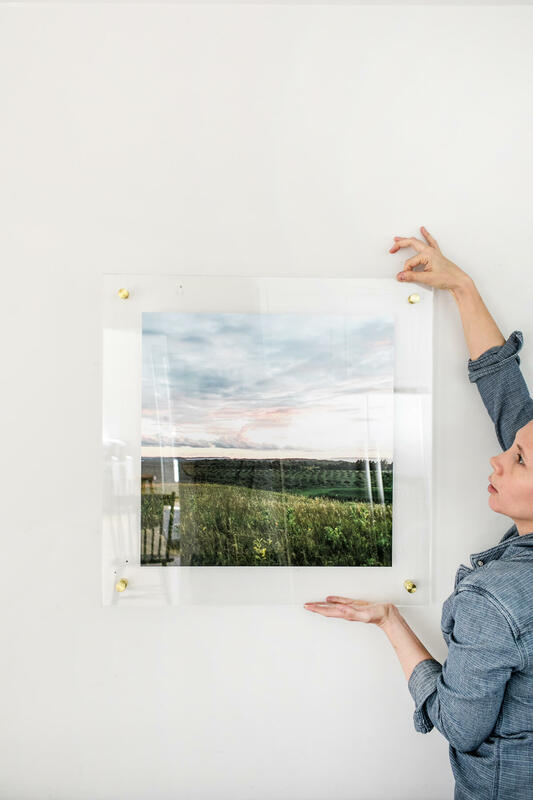 The images display a moment that had deep meaning to us; a gathering with friends on a summer evening full of fresh food from the garden, and a sunset view over Lake Michigan near the farmland where we live. Furthermore, I identified images to inspire us during season's change. The process was simple as I could upload the photos straight from our Instagram. I wanted to tell a full story with the images so I chose an image of my husband and I that we both loved, an image of our table gathering with friends, and the sunset from that evening. Since they all came from the same day the colors all compliment one another, which makes it easy to combine them together in a gallery wall. 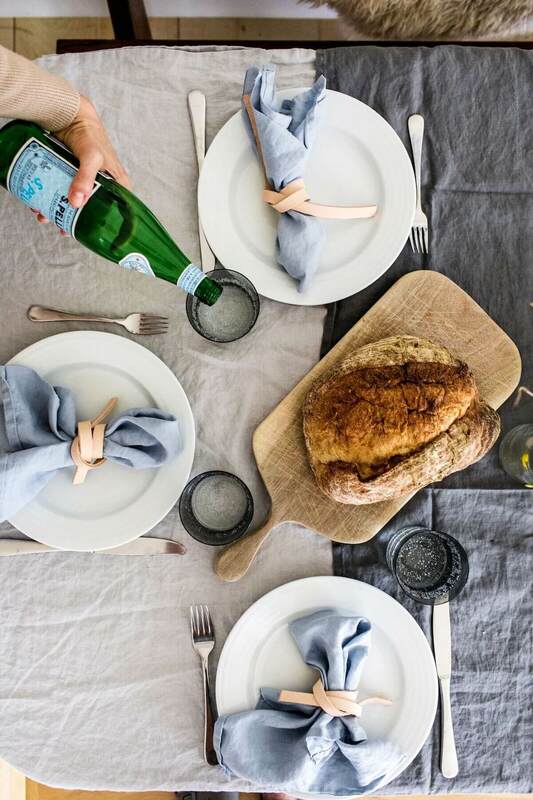 It doesn’t have to be complicated, but tossing on a light colored linen over a table can bring a light and airy feeling to the space. 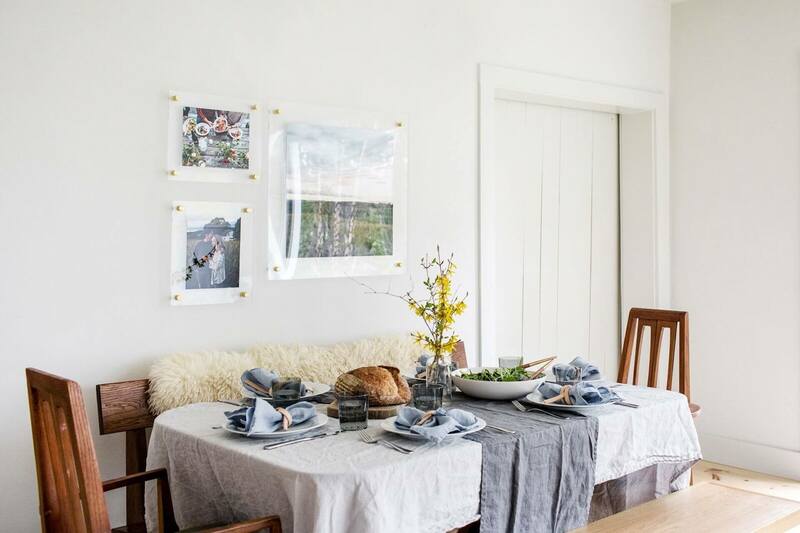 Add white plates to gather around when friends and family come over for dinner. It will feel special and simple without much effort. This time of year there are many beautiful blooms showing up. Look outside your door or in your neighborhood for the perfect ones to grace your table. In this case we used Forsythia, but Dogwood blossoms, cherry blossoms, and more could easily be the perfect fit if they have bloomed near you. Use the world around you to inspire what lands on your table. If you are still awaiting the blooms or live in a city, an alternative favorite of mine is greenery such as Eucalyptus and ferns — both of which are readily available at local groceries and markets at this time in the season. They bring in that fresh spring feeling without the delicateness of spring blooms. This time of year is a wonderful opportunity to freshen up a space that holds a lot of meaning in your life. Think of how you will let the light in more — not just in your space — but in your life. These longer sunnier days will only grow longer so take advantage of them in every way. Focus your efforts on the spaces you spend the most time and bring you the most joy. 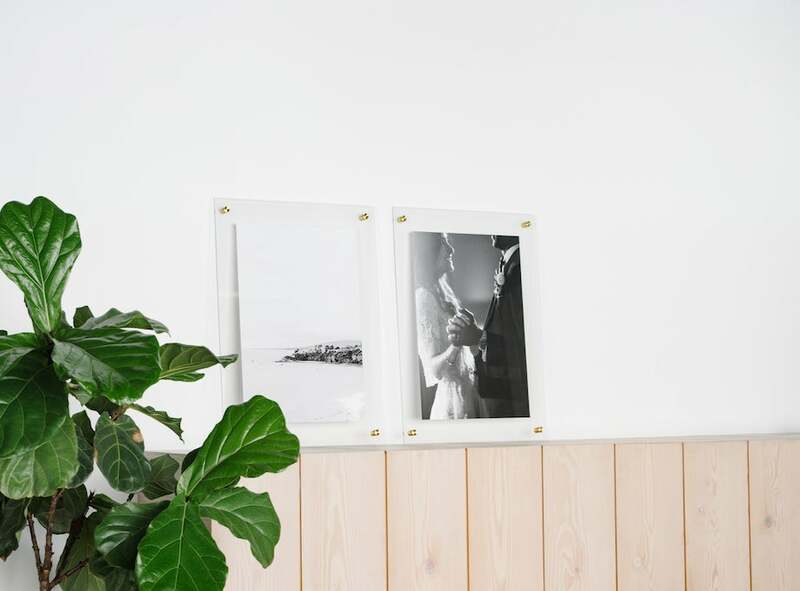 Bring light to your space with a new gallery wall featuring the Float Frame. Bring brightness into your space with simple elements such as linens, or a light colored throw pillow. 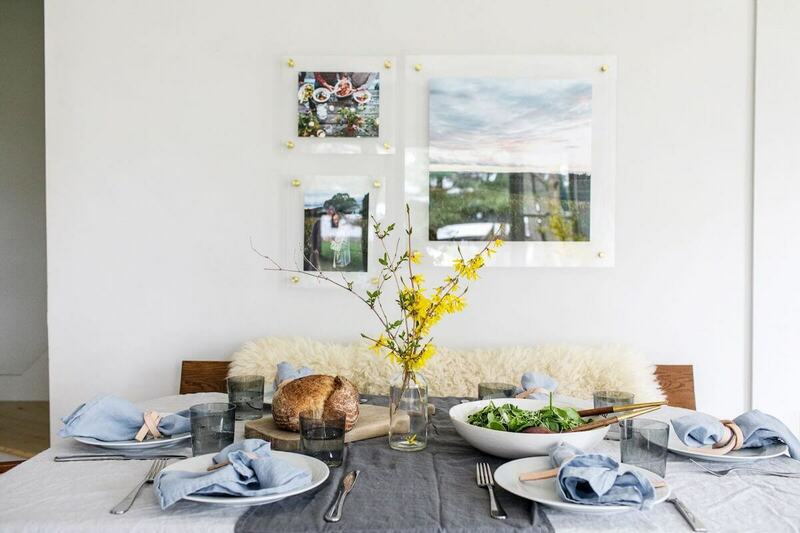 Treat yourself to some fresh new spring blooms, by bringing the outside into your home. Megan Gilger is the Creative Director and Blogger behind The Fresh Exchange, a lifestyle blog focused on living an intentionally seasonal life. 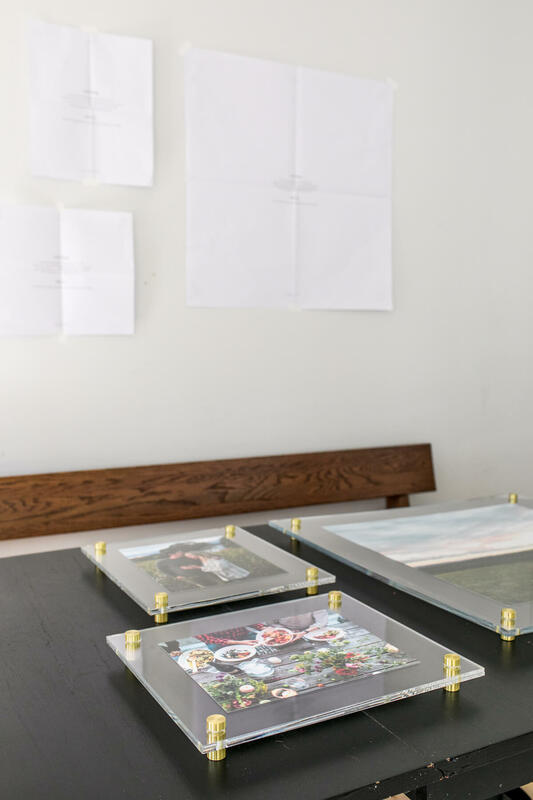 Megan and her husband, Mike spend their days creating content together for their blog on the shore of Lake Michigan in Traverse City, Michigan. Together they have a 1-year-old son and two dogs. They believe in living simply in order to have a life full of passion and creativity.